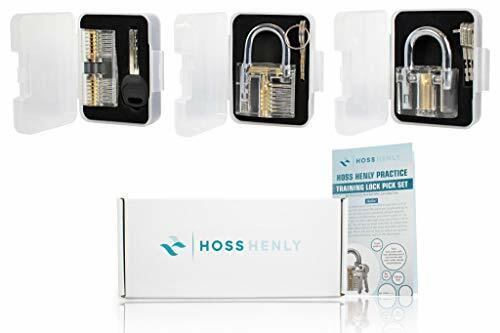 The Hoss Henly practice set is simply the best way to learn about locks and how to open them, and will provide you with a skill that will last a lifetime, at a price that can't be beat. This set provides an interesting challenge for anyone who is curious about locks, enjoys puzzles, or wants to learn survival skills as well as making a great gift for individuals of all ages! Locks included - All locks are acrylic cutaway locks with high visibility casing that allows you to see how the internal components operate. The internals are made from steel and brass components that will continue work for a long time. - Bar lock - Pad Lock - Cylinder lock (also called disc detainer lock) - Each lock comes with keys allowing you to see how the pins work under normal circumstances Instructional Content - Simple step by step guide to quickly get you started. The educational video will provide a detailed description of how locks work, showing the internal mechanisms, and how to open them without a key. GREAT FOR BEGINNERS - The transparent casing allows you to see internal mechanisms and learn how locks work. For those who want to become a Locksmith or just enjoy a challenging puzzle! SET CONTENTS - This set includes three different cutaway transparent locks to practice on, an instructional insert to get you started quickly, and a video providing in depth instructions. Unfortunately, we are not allowed to sell any tools with the set and they will need to be purchased separately. LEARN AN EDUCATIONAL AND USEFUL SKILL - Learn a skill that is useful in emergency situations, and for individuals who lose their keys, want to become a Locksmith, or just want to possess a unique talent. 100% SATISFACTION GUARENTEE - At Hoss Henly, we believe in excellent customer service and want all of our customers to be fully satisfied with our products. We offer a 45 day, no questions asked, money back guarantee and an 18 month warranty on everything in this set. If you have any questions about this product by Hoss Henly, contact us by completing and submitting the form below. If you are looking for a specif part number, please include it with your message.